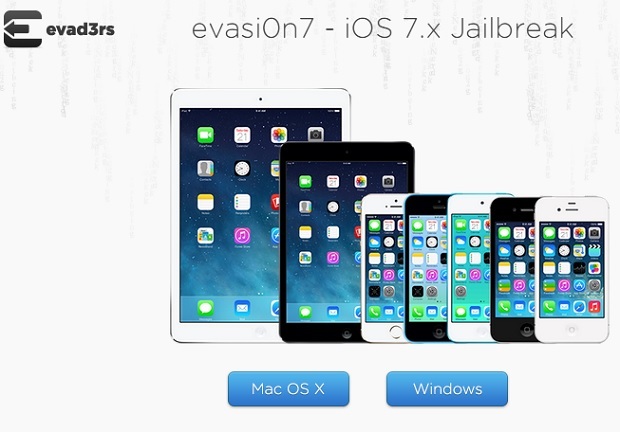 iOS 7 jailbreak is out, download Evasi0n now! Just in time for Christmas popular team of iOS Hackers Evad3rs have released Evasi0n tool capable of untethered jailbreaking iOS 7. The untethered iOS 7 jailbreak was in the works from past few months and its sudden release has come as a pleasant surprise to everyone. The untethered jailbreak supports all iOS devices including iPhone 5s, iPhone 5c, iPhone 5, iPhone 4s, iPhone 4, iPod touch 5, iPad 5, iPad 4, iPad 3, iPad 2, iPad mini Retina Display and original iPad mini. Users running iOS 7.0.4 or an older version can use the tool to jailbreak their device. You can download Evasi0n tool from the links below. Update: Here are our guides for iOS 7 jailbreak. Users of iPhone and iPad can follow these guides to untethered jailbreak their devices.